Kitchen Window — Summer Shell Game: Grilled Clams, Mussels, Shrimp Tucked in their natural confines and simmering in their own briny juices, these delicate meats cook up quick and delicious on the direct heat of the grill. But you may have to eat quickly, too. You can make them in dozens, yet somehow they vanish off the plate as inexorably as the last evening tide. Get recipes for Grilled Clams with Garlic Butter Sauce, Grilled Mussels with Simmered Tomatoes over Couscous, and Grilled Peel 'n' Eat Shrimp with Old Bay, Basil and Lemon. I love to eat shellfish in the summer. I love sucking the sweet meat out of shrimp and ordering their tails in a ring around a paper picnic plate. I love going to the nearest shoreline and feasting on fried clams till my pores shine. I love tearing through a mountain of mussels and piling their shells high in the compost, and then finding them a year later, bleached lavender, tucked among my vegetables as if they got lost coming home from the seaside. At the critical moment, the hinge muscle tightens and the shells spring apart with a POP. The clam, pink and tender, clings to the upper shell while a miniature soup dish of precious broth teeters on the grill. Everyone loves to grill in the summer. I think it's the freedom you feel under the open sky, and the pure and primitive heat below. It's the thrill of open fire beneath drifts of cumulus or distant thunder. It's the way the kiss of smoke and the buzz of charcoal dance and sing with a cold pale ale. It's the pot-less, scrub-less cleanup. In the past I rarely attempted to follow those two summer passions to their logical outcome: grilled shellfish. Hamburgers, hot dogs, ribs, chicken — every creature of the land can and did end up on my grill and my neighbors' grill, but for a long time I steered clear of crustaceans and let the bivalves be. I suppose that made a certain sense. Shellfish cook fast any way you approach them, so there's no speed advantage to a grill. Unit for unit, you need more shellfish per person than you do of say, steak, which means more work with the tongs. And the flame-kissed crust you get on grilled meat finds as little purchase on a clamshell as it would on a ceramic casserole. But recently I've discovered that to grill shellfish does have its charms. Separated from the infernal heat by only the open metalwork of a rack and an eighth-inch of organically grown calcium, the interior of a shellfish cooks fast and furiously, steamed tender in an instant in the fragrant, briny environment of its own shell. Whatever seawater suffuses that mysterious abode is the liquor that it cooks in, so no flavor is boiled or steamed away. (Lyons Press), will be released in fall 2011. Visit her blog, Cookbooks for Dinner. Clams on the grill seem devoid of drama, at first. They sit there, as motionless as castanets, silently enduring the hot, ceaseless persuasion of the flames. At the critical moment, the hinge muscle tightens and the shells spring apart with a POP. The clam, pink and tender, clings to the upper shell while a miniature soup dish of precious broth teeters on the grill. Mussels yield up their secrets sooner, hissing and creaking as their shells gradually open around the coral-colored bean of flesh. It takes them a few minutes to gape and stretch apart, and even then, the interiors may still need a minute more or two. The surest way to tell is to taste them for yourself. Go ahead, take one for the team. Easiest of all to cook are shrimp, with their color-coded alert system. It glows right through their cellophane shells, swiftly passing from the pearly gray of Raw to the luminous opaque blush that says Nearly There. By the time they've turned to sunset pink (i.e., Eat Me Now) there are savory charcoal spots on the shells, a visual guarantee that moisture and flavor have been temporarily heat-locked inside. With all shellfish, you'll want to airlift your prize away from those withering flames quickly, but it's not easy. Even if you're a demon with the tongs, you can't get every last one pulled away before the last stragglers start to overcook (not to mention that you've now singed the hairs on your forearm to a crisp). For me, salvation came from an unexpected source — a vegetable grate, little more than a stainless steel tray with 1/2-inch perforations. I'd bought it years ago in a spate of good intentions regarding vegetables (intentions that were never realized). I dug the grate out and plopped it right atop the Weber, where it would later provide my shellfish with the means for a speedy getaway. For as quick as they are to cook, shellfish are even quicker to eat. You can cook them by the dozen, yet somehow they vanish as inexorably as the last evening tide. As if it had never happened, there you find yourself time and time again, suddenly sated amid a heap of shells — alone with a tasty memory, and a still-warm grill. This recipe is adapted from The Summer Shack Cookbook by Jasper White (W.W. Norton, 2007). White says these serve 4 to 6 as an appetizer. The truth is, after making this recipe I actually ate the entire quantity myself in one frenzied sitting, and I wasn't even winded, although at least I didn't finish off the whole stick's worth of butter sauce. Let's compromise and say it serves two as a main dish. We'll assume you're reasonable people who eat nice salads and maybe some potato salad with your clams. Prepare a medium fire on grill. To make the sauce, heat 3 tablespoons of the butter in a 1-quart saucepan over low heat until it is foamy. Add the garlic and saute, stirring, until it is fragrant but has not colored, about 30 seconds. Add the white wine and heavy cream, increase the heat to medium-high and simmer to reduce by half, about 8 minutes. Add the remaining 5 tablespoons butter one piece at a time, whisking constantly until the sauce is shiny, emulsified and thick enough to coat the back of a spoon. Remove the saucepan from the heat, add the chives and season with salt and pepper. Set aside and keep warm until ready to serve. 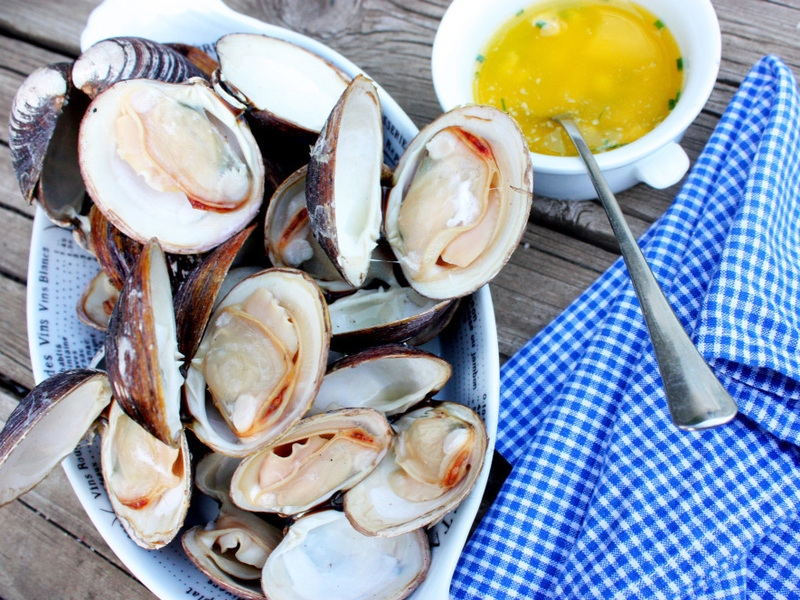 Set up the clams on a vegetable or shellfish grate, or place them directly on the grill. 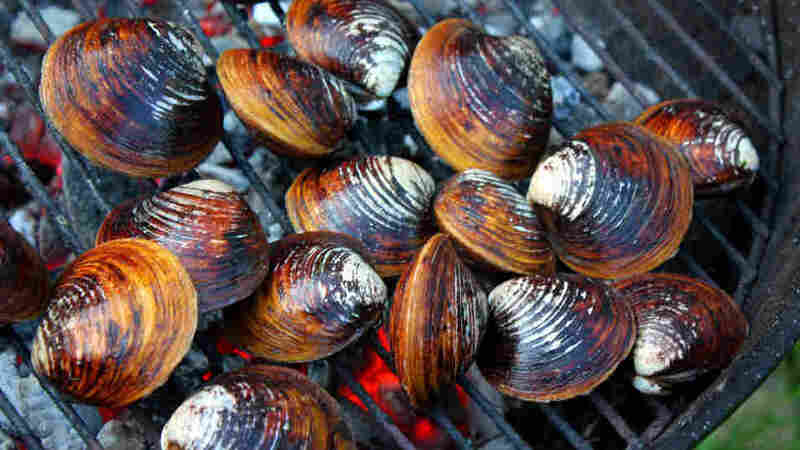 Grill the clams, without turning them, until they pop open, 8 to 10 minutes. Set the grate on a platter or heatproof cutting board. Or, if you are not using the grate, immediately and carefully transfer the clams with tongs to the platter or plates. Use the tongs to pry off the top shells. Spoon 1 teaspoon sauce over each clam and serve immediately. Is it necessary, you may wonder, to go through the fuss of deseeding the tomatoes and reserving the juice in this recipe adapted from Lucid Food by Louisa Shafia (10 Speed Press 2009)? I think it would work OK if you didn't, but the tomatoes would have a sloppier texture and the flavor wouldn't penetrate the couscous as well. It would also be a bit stickier in the pan. On the whole, I think it's worth the effort. Position a fine-mesh strainer over a bowl. Holding the tomatoes over the strainer, scoop out the seeds, letting the juice and seeds fall into the strainer. Press the seeds with a ladle to extract as much juice as possible. Discard the seeds and set the juice aside. Halve the tomato quarters and set them aside. Heat the oil in a large skillet over medium-high heat. Add the onion and saute for 5 minutes. Stir in the tomatoes, garlic and oregano. Add the wine and tomato juice and bring to a boil. Decrease the heat and boil gently, uncovered, for 12 minutes. Remove from the heat. Set the tomato mixture aside, covered. Put the couscous in a saucepan with 1 teaspoon salt. Bring 2 1/2 cups water to a boil and pour it over the couscous. Cover and simmer for 10 minutes, stirring occasionally. Turn off the heat and let it rest, covered, for 5 to 10 minutes. Fluff with a fork, then cover and set aside. Just before cooking, clean the mussels. Gently tap any open shells against a countertop and wait a minute for the shell to close. If the shell stays open, the mussel is dead and must be discarded. Remove the little thistle of fiber, called the beard, that sticks out of the shell by yanking it toward the narrow end of the mussel. Fill a large bowl halfway with cold water and stir in a handful of salt. Soak the mussels in the water for 30 minutes, then lift them out, leaving the debris behind, and set them in a colander. Heat a grill and place the mussels between the grates or atop a vegetable/shellfish grate. Grill until the mussels are open and cooked through, about 6 minutes. 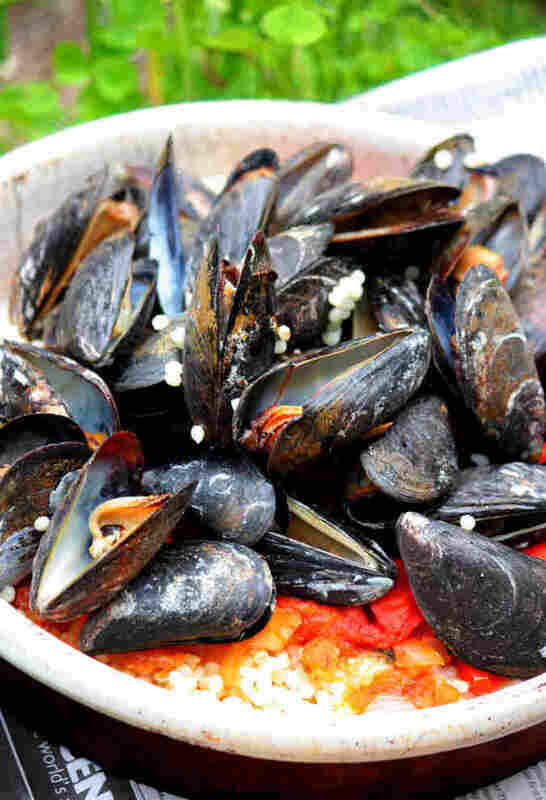 To serve, put a scoop of couscous on a plate, followed by the tomatoes, then the mussels. Season with salt, pepper and a dash of olive oil. Garnish with the parsley. For a long time I avoided Old Bay Seasoning, associating it with mildewy summer cabins, flimsy silverware and cobwebby, underused spice cabinets. Only in the past couple of years have I realized that as long as it's reasonably fresh, it's good stuff, with its widely applicable base of celery seed and paprika and warming spices. It doesn't even have MSG (or "hydrolyzed vegetable/wheat/soy protein" — different name for the same thing), like so many other spice mixes you can find on supermarket shelves. I had the time of my life licking the Old Bay right off these shrimp shells, and so did my son. This recipe is adapted from Grill It! by Chris Schlesinger and John Willoughby (DK Publishing 2010). Build a fire in grill. When the coals are all ignited, the fire has died down and the temperature is medium, you're ready to cook. Using a small, sharp knife or small scissors, slit the shell along the back of each shrimp, and remove the vein. 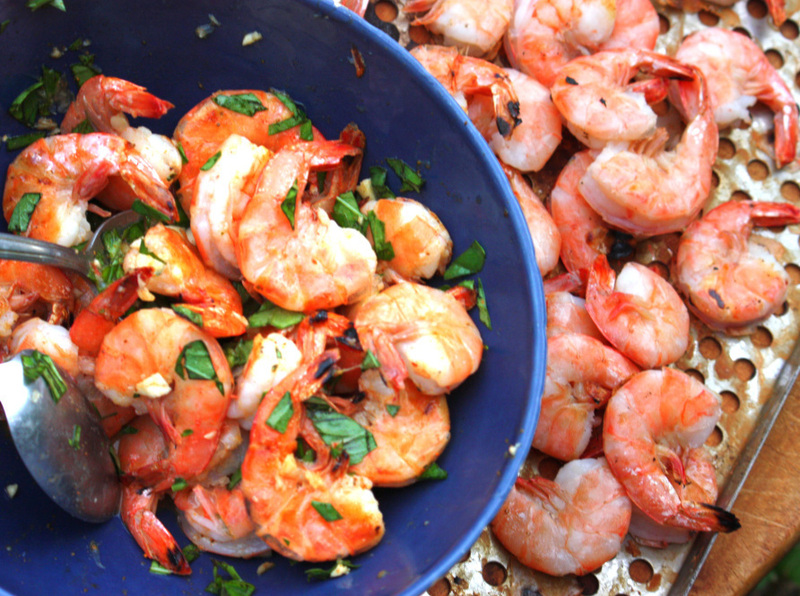 Toss the shrimp with the oil and salt and pepper in a large bowl. Put the shrimp on the grill over the coals and cook until they are opaque throughout (4 to 5 minutes per side). To check for doneness, cut into one of the shrimp at its thickest point to be sure it is opaque all the way through. While the shrimp are cooking, combine the lemon juice, basil, butter, garlic, Old Bay Seasoning, Tabasco, salt and pepper in a large bowl and mix together well. When the shrimp are done, add them to the bowl and toss gently until the butter is melted and the shrimp are nicely coated. Serve the shrimp right out of the bowl, with another big bowl on the side for the shells.